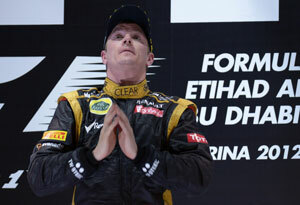 Kimi Raikkonen's hopes of boosting his challenge for the drivers world championship were encouraged this week with the news that his Lotus team are planning their biggest upgrade package of the year for next weekend's British Grand Prix. The 33-year-old Finn, who has lost ground to championship leader and defending triple champion German Sebastian Vettel of Red Bull in recent weeks, is currently 44 points behind. Vettel has 132 points ahead of Spaniard Fernando Alonso of Ferrari on 96 and Raikkonen on 88. But with the introduction of their new improvements, he believes he can bounce back to form after struggling at the last two races on temporary tracks in Monaco and Montreal. He said: "Silverstone is a more normal circuit and we've been OK at every other permanent circuit so far this year. There's no reason why we shouldn't be back to the positions we should be with this package."